If you "google" for quotes about patience, you'll come up with all sorts of high and mighty virtuous sayings. I laughed out loud as soon as I spotted Bierce's sardonic definition above. I've used the satirist's definitions a couple times in previous entries, too. Gotta get a copy of his Devil's Dictionary some day . . . I'm cynical enough to love stuff like this. Jim and I have tried very hard the last three months to be patient and just deal with summer living-at-home instead of summer camping-in-Wyoming-and-Colorado . . . but every few days we whine a bit to each other and talk about how much we miss being out West. 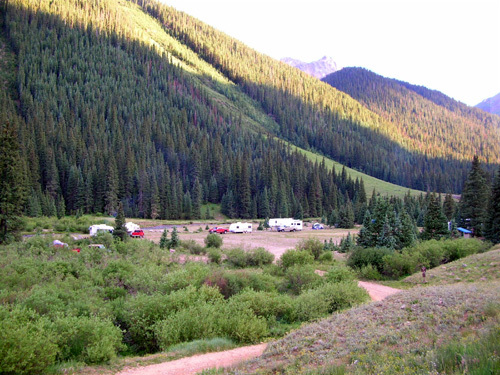 We came this close to driving the minivan to Silverton just to work Hardrock in July, but fortunately we regained our senses when we realized how logistically irrational that was. In hindsight we wish we'd gone out West for the whole summer again, cost of diesel be damned. (Ironically, it's come down enough in price recently that our trip back home at the end of August would have been cheaper.) We miss the cool mountain air, some of our favorite races, our ultra friends from around the globe, the more laid-back camping lifestyle. We are determined to go back next summer for at least six weeks, maybe more. 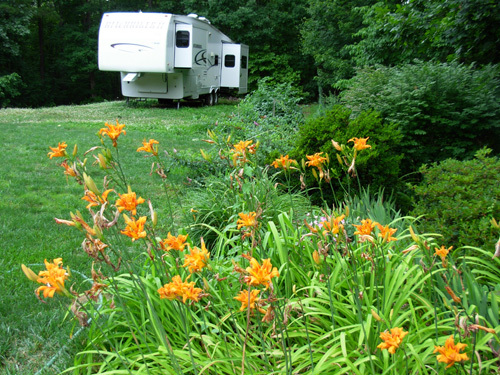 The main expense for such long trips is the fuel to haul the camper several thousand miles out and back. We are able to find plenty of inexpensive and free camping sites near our favorite races and trails in Wyoming and Colorado and we rarely eat out, so housing and food expenses are about the same as staying home.. Because of fuel, it's more cost-effective for us to stay out there several months rather than go for just a few days or weeks. However, long absences from home in the summer have a hidden "cost" that's harder to quantify -- keeping our yard and gardens weeded, watered, and mowed when we're gone. I'm not just talking about paying someone to do it. We have a retired neighbor who's willing to mow for a reasonable cost, and he provides great security, too. Last summer was so hot and dry he didn't need to mow but once a month, and this summer is similar. If Bob becomes unavailable, Jim has other friends in the rescue squad and fire department who can keep the grass under control. The main problem with extended summer trips is that all the perennial beds go haywire in our absence. Heck, it's hard to keep up with the yard and gardens while we're here this summer! We can't ask Bob to weed and water so much territory, and there isn't anyone else in the neighborhood we know to ask (nor any relatives close by to cajole). So the weeds get totally out of control; the beds look terrible all summer, and it takes a discouragingly long time for me to eradicate the weeds when we return in late August or September. In addition, some of the flowers and shrubs have died from lack of water when we aren't here. Roanoke has been in an extended drought for two or three years, and this summer has been particularly dry. It's easier to escape for several months in the winter, when the yard and gardens are dormant. We want to keep the yard looking nice, not just because of pride of ownership and for the sake of our neighbors, but also because we may sell this place in another year or two. 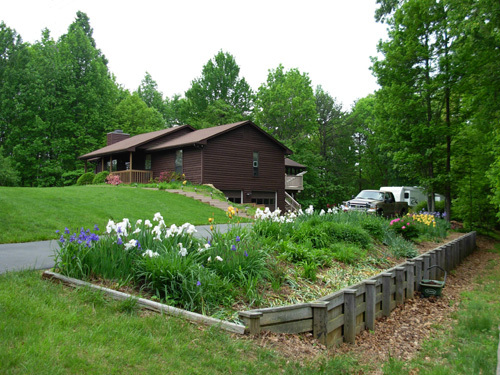 We love the house, yard, and woods, but it's all too much for us, considering we want to travel half the year. The stairs are also a problem as my granny knees get worse, and we'd rather be closer to town so we can participate in more activities there. We don't know if we'll stay in the Roanoke area or move back out West somewhere since that's where we like to be in both the summer and winter (Virginia is great in the spring and fall!). No matter where we buy another house, it's not at all practical to try to sell ours right now with housing and the stock markets continuing to tank and prices on everything UP, so we'll wait out the economic instability. We might be here for quite a while! Patience. Meanwhile, we're adapting to life in the Roanoke area in the summer. It certainly hasn't been all doom and gloom being at home in Virginia, our first full summer here since we arrived in March of 2004. There are a lot of things to enjoy and appreciate. 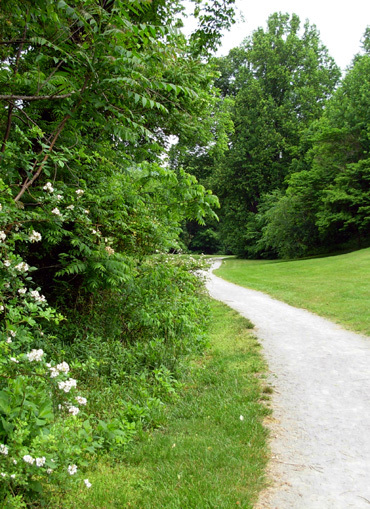 For one thing, there are all the factors that attracted us to Roanoke in the first place -- the beautiful scenery, the multitude of trails and nearby races, the Blue Ridge Parkway, the mountains, lakes, and streams, the friendly people, the interesting downtown area, the relatively low cost of living, the mild weather . . .
Well, OK, we've discovered summers aren't so mild here. I endured twenty-five summers in the Atlanta area, and I can tell you Roanoke is nearly as hot and humid even though it is over 400 miles farther northeast! We missed last summer's record-breaking temperatures in August, and we're keeping our fingers crossed that there isn't a repeat this year (so far, August has been cooler than June). June began with a ten-day period of unseasonable 90+ degree temps, but thankfully the rest of the summer has been less intense. The humidity is so thick it feels like you can cut it with a knife most days, however. Training has been a challenge, especially since we aren't real good about hitting the trail before 8 or 9 AM. We try to do most of our running and yard work in the early morning, then hole up inside the cool house during the afternoon when it's miserably warm and muggy outside. Jim and I don't do well in either extreme heat OR cold. Housing and jobs in the Roanoke area haven't taken as serious a beating this year as in many areas of the country. Although gas, utilities, food, other goods, and services have all recently spiked upward, it's still a comparatively reasonable place to live. We both do our best to "live below our means," although we periodically have weird and/or unexpected expenses that eat into our "play" money for races, travel, hobbies, and other non-necessities -- a new heat pump, vehicle repairs, ailing dog (Tater has a multitude of physical problems now at age 12), etc. It's been interesting to see how low we can keep our electric bill this summer. We make a (serious) game of it. For example, we use the solar panels from the camper to power some of the lights and appliances inside the house, we keep foam panels in some of the windows when the sun shines directly on them (most are shaded by the trees), and we turn off lights and gadgets when we're not using them. Jim installed a fan to draw out heat from the attic, and the new, high-efficiency heat pump costs much less to run than our old, seriously-undersized one. We're perfectly comfortable on hot, humid days in our dry, 76-degree air inside the house; keeping the temperature higher than some folks deem acceptable also saves us money (we do the reverse in the winter, keeping it lower than average). Jim and I are also more mindful of the miles we drive into town (at least 17 miles one way) and to our favorite running venues (above, 13-15 miles each way). We still get in three weight workouts a week at the YMCA and run several days a week at the closest trails. We aren't traveling as often to some of the trails farther away that we used to run before the price of gas spiked. We're also riding together more often and taking the more fuel-efficient Odyssey minivan instead of both vehicles for our various errands. It takes planning and compromise, but we're conserving fuel and $$$. There was an article in our paper recently reporting that Americans drove 12.2 billion fewer miles in June of 2008 than June of 2007 -- that indicates a lot of "staycations" and other modifications of driving habits. Patience. Adaptation. We aren't alone. 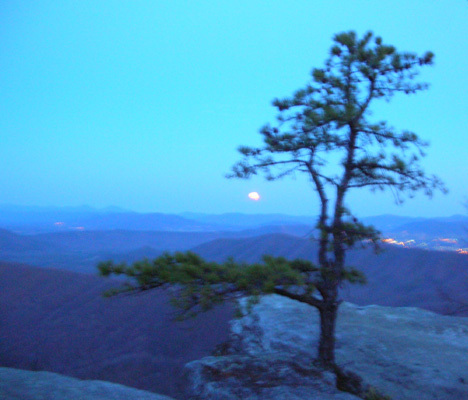 Then there's the scenery in the Roanoke area . . . It's not as spectacular as the Rockies, but our mountains, trees, lakes, rivers, and creeks are very beautiful (and accessible) any time of the year and especially in the warmer months. Spring and summer are very green despite the drought. 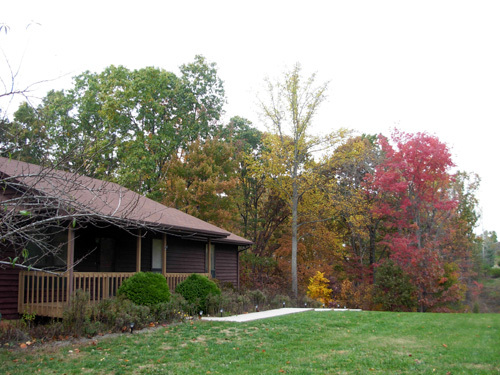 I love watching the progression of flowering plants, shrubs, and trees in our yard and all around the area. We haven't been motivated so far this summer to go on any overnight trips around Virginia to run or sightsee but we have been on and near the AT to train and we love riding on the Blue Ridge Parkway near home. We're making do and trying to enjoy every day. It's fun when we discover something positive about summer-at-home that we didn't realize or fully appreciate before. 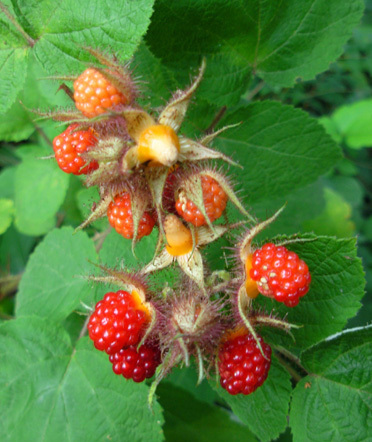 One nice surprise was finding a plentiful supply of succulent wineberries along one of the trails we like to run adjacent to the Blue Ridge Parkway. Not many hikers, runners, or equestrians use this trail, and we didn't broadcast our find to anyone else except my brother and his wife, who were visiting from the Midwest! Neither Jim nor I had tasted or seen wineberries previously. One day I saw a couple who lives near the trail picking some berries for home made ice cream; they told me what they are. For the next three weeks, Jim and I made a point to run that trail more often! I use "run" loosely, because we stopped every few feet to pick the tasty berries and eat them right then and there. They are sweeter and juicier than any of the local raspberries and blackberries we've found. 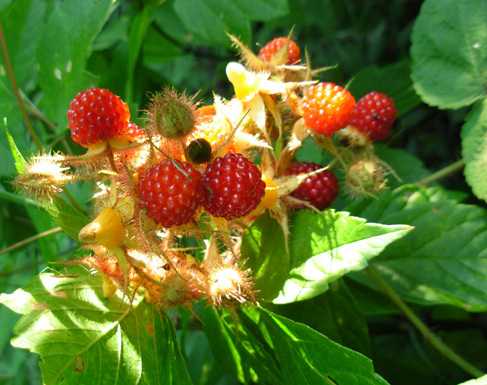 At their peak in early July, I filled a quart bag full of plump, ripe berries to take home a couple of times. My brother and sister-in-law were also able to take some home with them in early July. The berries were delicious in cereal, yogurt, and ice cream. I never picked enough to freeze, but I could have done so without feeling guilty. The last couple weeks of their season, berries were decaying on the canes because not enough people and birds were taking them. Speaking of birds . . . did you know that hummingbirds can be quite the little aerial artists, zooming here and there with amazing speed and alacrity? Their wings make interesting "chirping" and other vibration sounds as they dive in for a landing at the feeders and make sudden turns. 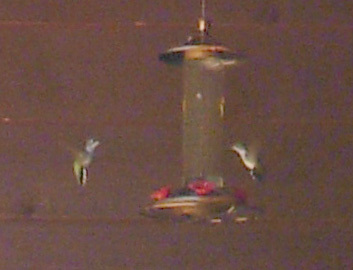 It's fun to watch their social interactions at the feeders. Some play nicely and some are little terrorists. 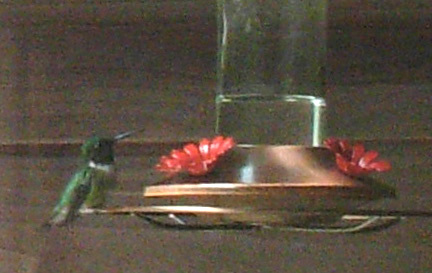 We discovered the joys of hummingbirds soon after we moved to Roanoke. This is apparently a pretty busy migratory route for them, although we haven't seen as many different kinds of hummers here as we've seen where we've camped in Colorado and Arizona. I guess we've inadvertently teased the birds in previous years because we'd set up a feeder in May, leave home from June to September, and hang it up again when we returned. They always came back, or new ones found us in the early fall, but I wonder how they fed themselves all summer? 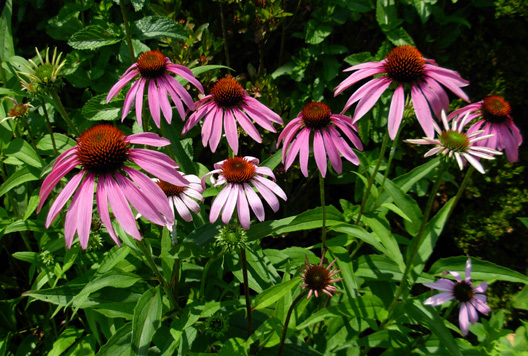 Our flowers, perhaps -- they like those, too. We're curious just how many of the little guys we're feeding this summer. 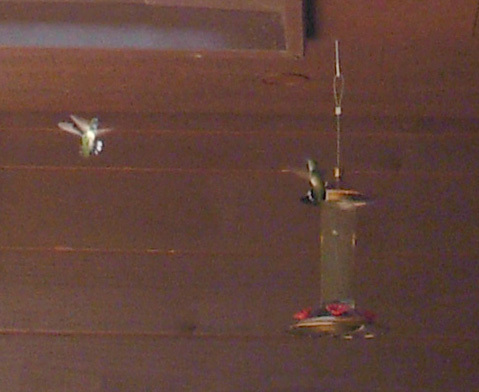 We've seen up to nine or ten at a time while we're sitting out on the deck, seven from inside the house. (They move so fast, they're hard to count!) One web site says to multiply that number by three or four to estimate how many total birds are using the feeders but I don't know how accurate that is. What I do know is that those birds go through over two cups of "bird juice" a day! It seems like we're always making the sugar-water concoction for them Jim jokes that they're going to eat us out of house and home. 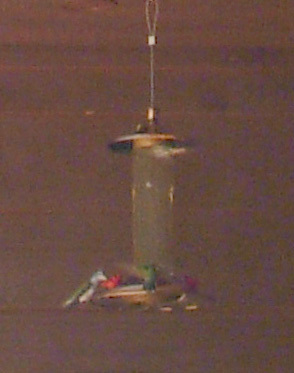 Some of the birds are more territorial and aggressive than that, however, quickly shooing off any others that come close to "their" feeder. 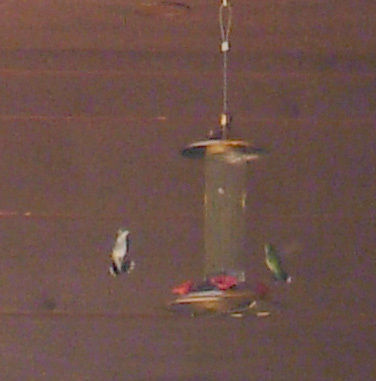 The ruby-throated hummers are the worst offenders we've observed at our house. 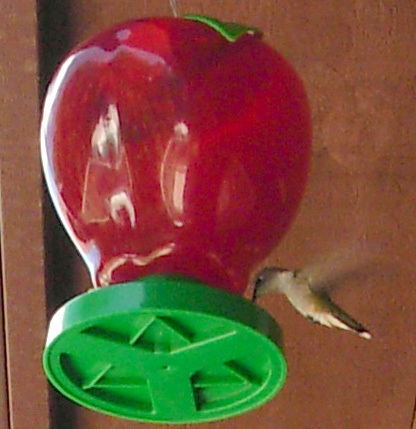 For a couple weeks we had one male ruby-throat (shown below) that we called the "Juice Nazi" in memory of the Soup Nazi in one of our favorite Seinfeld episodes. No juice for you!! he seemed to say to every bird who approached the feeder in the corner that he was defending. It was so funny because he'd just perch there and not even drink! 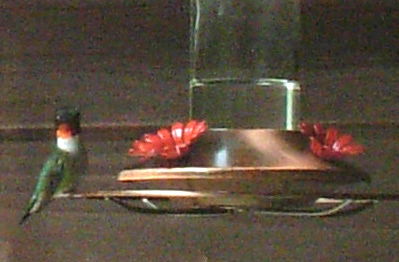 None of the other birds have ever perched for even a few seconds, let alone minutes at a time. 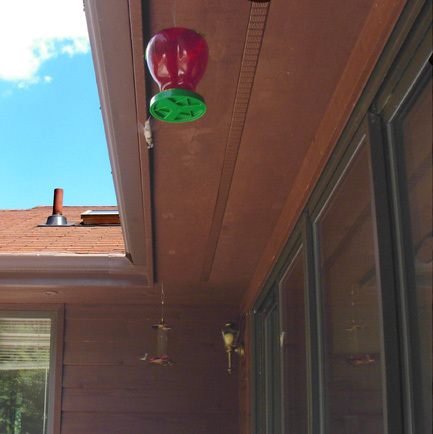 Even more odd, he faced the corner of the deck and not the direction from which the other birds would swoop in. Apparently he could hear them coming. Every time another bird would approach, he'd suddenly fly up, chase it off, then resume his position. We'll miss our little feathered friends when they fly south for the winter. What great entertainment! Since it hasn't been raining much this summer, Jim doesn't have to mow very often. That's the good news. The bad news is that our lawn is more brown than green in the front yard. That drives him crazy. There's just too much area to water and we have no intention of installing that large of an irrigation system. We're on well water. Although it's basically free except for the electricity to run the pump, we don't want the well to go dry. We're using enough water to keep the shrubs and flowers and some ornamental and fruit trees alive, but grass is expendable and all the huge trees in the woods are on their own. When we're gone in the summer, the brown grass is moot -- we don't see how bad it looks, and enough rain has fallen by the time we come home that the lawn looks better. Sometimes ignorance is bliss, or at least less stresssful. Bright green grass in our front yard last November, but right now it's mostly brown. I mentioned the problems we face when we leave home for long periods of time in the summer -- the weeds and drought. There's also a problem with leaving home too early in the fall for our winter trip -- all our deciduous trees have many, many leaves. They don't stop falling until late November in this climate. We don't rake. Jim mulches them with his lawn tractor or collects them in the tractor's leaf bins for composting. 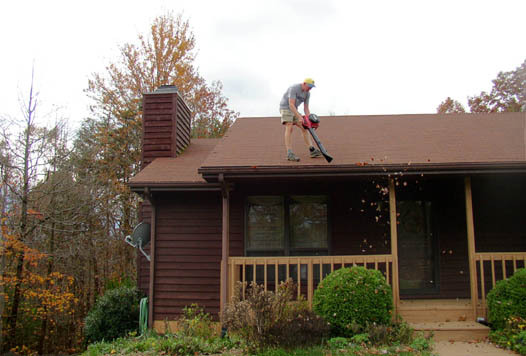 He also gets up on the roof to clean out the gutters (photo below). Maybe it's about time we got those leaf-guard thingies for the gutters so we'll have more travel flexibility in the fall . . . It may not be such a problem this year, however. 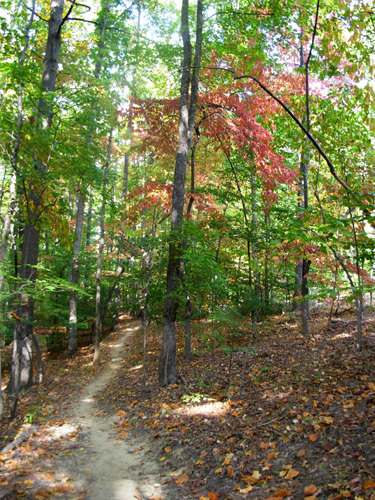 Some leaves are already starting to fall because of the drought. Maybe they'll all be down by the time we want to leave in early November. We've been good little squirrels this spring and summer, cutting up and/or scavenging hardwood for the wood stove this winter. Last year we ran out even though we were gone for two months and we had a big electric bill for heating our first month back (February-March). 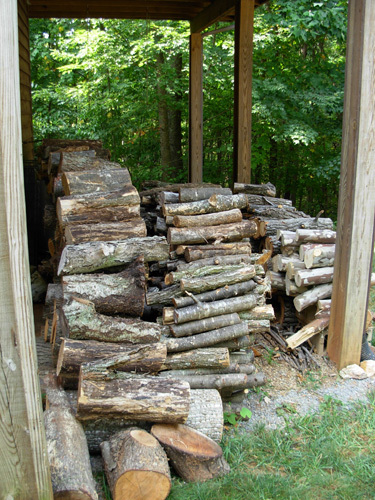 We have a much larger supply "squirreled away" this time, although it's been a lot of work to cut, haul, and stack it. Most has been from our own property, some offered by friends and neighbors who wanted the wood removed, and a bit we've rescued after storms brought them down on public property (county, not federal). 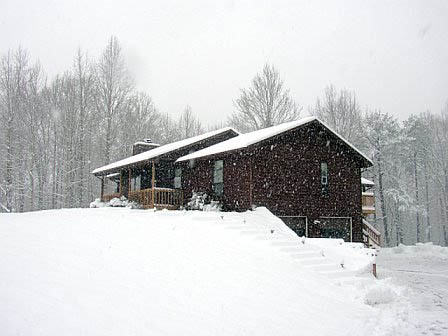 Between the extra fire wood and the new high-efficiency heat pump, our winter heating bills should be as low as our summer cooling bills. No kidding -- they're great with all the cost-saving things we've been doing that I mentioned above! It helps that the new HVAC system is infinitely more efficient than the old one (and cost more than our summer trip to Colorado would have been). Patience. It will eventually pay for itself. Lots of things. There isn't any moss growing under our feet. Jim's been keeping busy with the rescue squad all summer. It's all volunteer work but it has some perks. He passed his EMT-Enhanced test (written and practical) in mid-June with flying colors, second highest in his class. He considered taking an intermediate class from August to next June, then decided it would interfere too much with our travels to races. He gets a lot of on-the-job training with the number of calls he takes, and occasional one- or two-day specialty classes offered by the county. We also keep busy with gardening (see next two entries), our training (another one or two entries coming up soon), plans for our fall and winter travel itinerary (ditto), volunteer trail maintenance on several local trails, other volunteer work in the community, local races, participating in activities with the organizations to which we belong, seeing friends, visiting relatives, keeping our house and vehicles maintained, providing geriatric care to our aging Labrador retriever, and enjoying various other projects and hobbies (like the AT memory books -- I'm only about a quarter done with those)..
Jim still jokes that he got more done when he was working full time than he does since he's retired. Well, Sweetie, you aren't 55 -- let alone 35 -- any more and neither am I. We hate to admit it, but we just don't have as much energy as we used to. Mid-afternoon naps sometimes help. Around 2 PM it's about all we can do to stay awake!